These thick and chewy cutout gingerbread cookies have an intense gingerbread flavor with a delicious and surprising soft chewiness. Gingerbread is a classic Christmas flavor. I love it. But I have to admit I’m not a huge fan of thin and crispy gingerbread cookies. I’ve always wanted a gingerbread cookie similar in texture to a really good sugar cookie. This recipe fits the bill. These cookies are packed with gingerbread flavor but the texture has a delicious and surprising softness and chewiness that keeps me going back for just one more gingerbread man. The dough requires chilling and freezing in order for the cookies to keep their shape, but the time invested is well worth it. And as a sidenote, the cookies are egg-free in case that happens to be an allergy you are working around. These cookies are such a favorite, we make them every holiday season. One taste, and I think you’ll know why. As with all cutout cookies like this, you can get as fancy as you like decorating the cute little shapes. You can see I leave the decorations pretty simple (that might have something to do with the fact that I’m usually juggling a child or three while making and decorating). And you don’t have to feel pressured into only using a gingerbread person cookie cutter, either! Obviously, you can use whatever shape of cookie cutter your little heart desires. As I mentioned above, because the texture of the dough is a little different than other cutout gingerbread cookies, it’s important to chill the dough per the recipe so the cookies don’t spread or flatten. One last note, the baked and cooled cookies freeze great! I stack them in large tupperware-like containers with sheets of parchment or wax paper inbetween the layers. With an electric mixer, stir together the flour, brown sugar, soda, cinnamon, ginger, cloves and salt at low speed until combined, about 30 seconds. Stop the mixer and add the butter pieces. Mix at medium-low speed until the mixture is sandy and resembles fine meal, 1 to 2 minutes. Reduce the speed to low and with the mixer running, gradually add the molasses and milk; mix until the dough is evenly moistened about 20 seconds. Increase the speed to medium and mix until thoroughly combined, about 10 seconds. Preheat the oven to 350 degrees. Line 2 baking sheets with parchment paper or silpat liners. Remove one dough sheet from the freezer and place on the counter. Peel off the top parchment or wax paper sheet. Gently cut the dough into 5-inch gingerbread people or 3-inch gingerbread cookies, transferring the shapes to the prepared baking sheets with a wide metal spatula and spacing them ¾ inch apart. Set the scraps aside. Repeat with the remaining dough until the baking sheets are full. Because flour is not added during rolling, dough scraps can be rolled and cut as many times as necessary. Bake the cookies until set in the centers and the dough barely retains and imprint when touched very gently with fingertip, 8 to 9 minutes. Do not overbake!! Cool the cookies on the sheets 2 minutes, then remove the cookies with a wide metal spatula to a wire rack; cool to room temperature. Gather the scraps; repeat the rolling, cutting and baking. Frost as desired (I used a ziploc bag filled with simple white icing). Store soft gingerbread in a wide, shallow airtight container or tin with a sheet of parchment paper between the cookie layers. These cookies are best eaten within one week. This is my very first time baking (and eating) gingerbread cookies (they are not common in our country, but I have always wanted to make them since they looked so delicious in American movies) and I have to say that we all loved them (specially my dad, who is not into baked goods). Thank you! I used maple syrup instead of dark molasses and 2 teaspoons of baking powder instead of baking soda and they turned out a little like butter cookies, which was perfect for us. These were amazing!! So so easy. And delicious. I searched tons of recipes looking for a soft, thick, chewy cookie, similar to the perfect sugar cookie. THIS IS IT! first off it was so easy to make and refrigerate over night. I made it exactly like the recipe. Didn’t change a thing. Everyone loved them. They were great the day after baking as well, I put a simple cookie icing on top and really went well together. Will be making again and now my go to Gingerbread recipe. These are really not good. I have been baking gingerbread cookies for many years and these taste like total molasses! Followed the recipe to a tee. I dont like giving bad reviews but this is a waste of ingredients. I followed the directions exactly, and as the recipe suggests… These cookies were quite chewy, which is great. The only problem is that they taste way too strong of molasses as I used a dark molasses. I would no longer called them gingerbread cookies, but molasses cookies. I would use the recipe again, but would maybe use light molasses? When taking out the oven.. are they suppose to be extremely soft? Can I make a giant gingerbread cookie with this recipe? If so, are there any adjustments? I will be using the giant cookie pan made by Wilton. I’ve never tried that but you could definitely experiment! If the dough is thicker than the cookies pictured in the post, you’ll want to adjust the baking time. Good luck! Can this dough be frozen after rolled and cut the next day? It’ll probably need to thaw just a bit out of the freezer to cut, but yes, you could freeze it after rolling. Um…these are totally delicious. Soft and flavorful. I just pulled them out of the oven (yes a pre dinner snack) and I can’t stop eating them. So good! Best. Gingerbread. Ever. I have been bringing various desserts to my VERY picky parents (now 87 and 84 respectively) for literally years. And they always found something wrong with them, they were never quite right (“too sweet,” “not tart enough,” “too dense,” “too moist” etc). There was the apple crisp year. There was the chocolate chip cookie year. And the final nail in the coffin (so to speak) was the lemon pound cake year. I gave up trying. And then, this year, came these gingerbread cookies. I originally made them for my daughter (who helped me roll out the dough and did the decoration- a simply white Royal Icing), who intensely dislikes thin and crispy cookies of any kind. She went crazy over these. So, on a flyer, I took them to my folks. And they loved them. My mother said they are “one of my best desserts ever.” She is eating them for breakfast, and for dessert. THANK YOU, Mel! This recipe means more to me than you can possibly know. So happy to hear that! Thank you for letting me know! These were amazing! I made them for Christmas with my littles. After reading reviews I cut back the ginger just a bit and made sure they were rolled out quite thick so they would hold their shapes. I didn’t add icing but they were still the first of all the cookies to go. Will make again next year for sure! I just made the batter for these. The butter is not well incorporated and I had to add at least 3 times the amount of milk to even get it to combine. Any ideas what went wrong? I’m not sure, Justine – any chance the dough was overfloured? Will you please share the frosting recipe you use for these cookies? I usually use the royal icing recipe from the meringue powder can or this simple vanilla frosting. Just make these, love the dough, but OMG WAY too much ginger. Will use this batch to decorate and hang on the tree as these cookies are too hot for children to eat and will make a new batch with 1 tsp ginger versus 2 Tablespoons. Well, maybe if you READ the recipe correctly, you wouldn’t have had an issue, as it says 1 Tablespoon of Ginger, NOT 2. Hello. Can you use blackstrap molasses in these? Should I reduce the amount? They look great! I only ever use blackstrap, without adjusting the amount, and they’re rich+delicious. The dough is sticky and I’m religious about freezing before, during , and after cutting them out. But I can endorse blackstrap, for sure! These were terrific. Only change I made was adding vanilla. They were chewy as described and really tasty. My kids really enjoyed these, but next time we make these we might reduce the spices just a smidge to suit our tastes. We did decorate ours with frosting, but they truly didn’t need to be iced. They are so delicious on their own. Thank you so much for sharing your recipe. We had fun making and eating these. Can anybody tell me how many dozen of cookies this makes. The yield is above the recipe title – it makes about 2 dozen. For me, it made about 5 dozen cookies! I made a dozen 6″ gingerbread men, and the rest with assorted 2-3″ cutters. Instead of icing, I placed cinnamon imperials for the eyes and one in the middle of the rest. Rolling the dough out and placing it in the refrig overnight, made them very easy to work with. Delicious! So after reading some of these comments, people are saying the shape hold for them. I agree, they didn’t for me at first even after refrigeration. What I did was rolled out the dough, and used cookie cutters of my choice, layed them on a cookie sheet, then I refrigeratated them for a few hours. I then popped them in the oven straight of of the fridge and they held their shape!!! Even the intricate cookie shapes was no problem for this dough. Thank you for the amazing recipe!!!! These cookies are the BEST gingerbread cookie I have ever eaten. I had a tried and true recipe, but lost it. Found you online, and am delighted with the result. My grandchildren will love decorating them and eating them! Now, when I am looking for a new recipe, I will trust you to have tested many recipes and identified the best one. So, no more testing for me – just trusting you! So happy they worked out! Thanks for letting me know! Hi! I am Addison, and I am 11 years old and I love to bake. 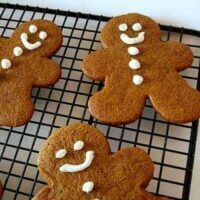 I have always used your recipes and these gingerbread cookies are one of my all time favorites. I am going to give some of these cookies to my teacher. I also love your chocolate kiss blossom cookie. Your amazing! THANKS!!!!! You are amazing, Addison! Thank you for commenting! These cookies are fantastic!! 100% my go-to gingerbread recipe! My only comment would be to make absolutely sure you put in enough salt! The salt is what brings out the spices in the cookie and I forgot to add it one time when I made this recipe and it made it taste really bland! This recipe has been my go to gingerbread cookie for several years now….I love these cookies SO MUCH. I literally think about them all year! My youngest daughter has a dairy intolerance and I was wondering if you or anyone else has had any success making these with a non dairy butter or a substitute? I haven’t tried a non-dairy sub – sorry, Rachel! Made these last year and loved it!! I used unsalted butter last time, but wanted to check if you use unsalted or salted? Your sugar cookie recipe uses salted, so I was just curious if this one would turn out better using salted too. Thanks! I absolutely love this recipe! It was quick and easy and my grandson really enjoyed the cookies! All of Mel’s cookie recipes are my GO TO! I can even make them vegan/gluten free for all of my friends. These are delicious and I will never use a different recipe for gingerbread. This recipe was the answer to my Christmas! I only like gingerbread if it is soft and chewy but never found one that turned out right. This was so easy and turned out perfectly! I did chill the dough in plastic wrap in the fridge overnight. We cut out reindeer and piped their red noses. YUM! I made these without refined sugar by subbing date syrup for the brown sugar. That made the dough pretty sticky so omitted the milk and added about 1/3 cup more flour. The keys for me for getting them super soft was rolling out thick like you said and NOT over baking. I found 5-7 minutes to be ideal, depending on the temp of the dough and the cookie sheet. Thank you for your recipes, they are always great! I am going to make these, I’m a little confused about the rolling out and refrigerating? However we have a bakery here in Salt Lake City that dips the bottom half in milk chocolate… I am so going to do that with these. Thank you for sharing! These are the best! My daughter has made several batches now and they stay chewy and moist! They held their shape perfectly and you can really taste the spices! We will never need another gingerbread recipe! Thank you! Is it possible to put a picture on this comment site? Hi Carol – so glad you and your daughter love this recipe! There isn’t a way to add a picture here…sorry about that! Mel these were life changing. I don’t even like gingerbread or so I thought. I ate five. Yes five. Our elderly friend mother of seven loves them too. Score! And now I have to try all the other gingerbread recipes on here. I am obsessed with the flavor of these cookies but unfortunately they spread too much for what I need them for. I have tried to play around with the recipe so it won’t spread, but so far no luck. Any ideas? I need cookies with crisp edges for decorating. Thanks! These might not be the right cookie, I’m afraid – they are meant to be soft and chewy, not crisp like a traditional gingerbread cutout cookie. I made these today and dipped half of each cookie in chocolate. This has made a great holiday treat! I love the flavor. Thanks! I just posted the same thing! I’m going to dip them in chocolate as well! Best gingerbread recipe I’ve tried yet, and I’ve tried quite a few. Thick, moist and chewy, like I remember as a little girl. These are my favorite Christmas cookies. THANK YOU!!!! Just finished these cookies for Christmas and they were such a hit!! I will definitely be saving this recipe for next year. The cookies were perfect for me because I prefer them to be a little softer and slightly chewy…these came out perfect!! I tried both your recipe and the King Arthur Flour recipe this year for gingerbread men. I found them similar in taste and texture (which I loved both!) but your method for rolling out and chilling the dough was the hands down winner! Rolling between parchment while the dough is still soft, and then freezing the rolled out dough before cutting out the cookies worked great. Thanks for sharing this delicious recipe! This recipe is GOLD!!! Gingerbread cookie *dough* is my favorite thing about cookies, ever. But the cookies always dissapoint. At last, here’s a recipe where the cookie tastes better than the best dough. It’s perfectly assembled — and the caution against overbaking is very important. Thank you for changing my holiday baking forever! These cookies were a heartbreaker for me. So many folks seem to have had success with them, but mine came out of the freezer so stuck to the wax paper that I had to throw the whole batch away. I tried letting get softer, letting them get harder, no matter what they were just tragically stuck. By the end there were pieces of wax paper all through the dough so it wasn’t salvageable. I’m not a terrible baker, and followed the recipe so I’m not sure what happened here. Sorry these didn’t work out for you, Kelsey. Any chance your dough needed a bit more flour? Just a thought in case it helps…I had a similar problem last year when I made these, but I was able to determine it was the wax paper. When I used parchment paper instead, there was no sticking! Maybe some brands of wax paper don’t work as well. These sound great! I am wondering if subbing coconut oil for the butter would work. What do you think? I haven’t tried that, Lisa, so I’m not sure but usually coconut oil subs pretty well for butter in cookies so I’d say it’s worth a try. First eggless cookie recipe that i can truly say you do not miss the egg! Very flavourful, perfectly chewy and soft…so good! I followed the directions to a T and got perfect results. I added white chocolate chips and it went well. Thank you for posting this recipe. I made these with my 2 kids and they were a huge hit! My son has an egg allergy, and I can’t thank you enough for something he can decorate that is also delicious! And these are just plain Delicious! We made not only gingerbread men, but also snowmen, trees, and snowflakes. The entire batch was gone in 3 days, my husband is requesting more this weekend, he says it’s he best cookie we’ve ever made. 3 cups is 24 oz. 3/4 cup is 6 oz. That’s true if you are including ounces for the volume, but the ounces I’m including in the recipe is for weight. Do you happen to know if these freeze well after being baked? Thanks! Hi Jordan – I’ve never frozen these but I suspect they would freeze just fine. These cookies. I have no words. They’re amazing! So good in fact, I must have missed the memo that gingerbread is only for Xmas (cause I just baked another batch the other night). And can I tell you a secret? When my husband and kids aren’t looking, I totally sandwich vanilla ice cream between two cookies. Whoa. If they knew what mom was doing those cookies would be gone in a heartbeat! As always, thanks so much from Canada! Sonya – you sound like me; known to do crazy things like putting ice cream in between two cookies when no one is looking. 🙂 Glad you loved these! As I started making these my husband (aka Cookie Monster) said ‘just so you know I’m not a huge fan of gingerbread’- well after they came out of the oven he had a change if heart, ‘you can make those again anytime!’ So they have all been devoured and I’m doubling it for the Christmas batch! Thanks for the recipe. Suzanne, I too was worried about so much molasses, and about so much spice. This was my first gingerbread making experience, but I could not be happier with the result! Not too strong flavored, good and chewy. Great recipe, Melanie! The bottle doesn’t say blackstrap molasses, it just says Wholesome Sweeteners organic molasses unsulphured. Thats the kind i used and its actually made with blackstrap molasses. It says it in the ingredient list. Hi Mel! I’m wondering if my particular type/brand of molasses is extra strong b/c I made the same chewy gingersnaps my sister made and hers turned out much lighter in color and less molasses tasting. Accordingly, I’m worried about using the full amount of molasses in these cookies, but really want to try them, do you know if it would affect the cookies much if I dialed back the amount of molasses and if I should add something in it’s place? Suzanne – are you using blackstrap molasses? That kind will definitely have a darker appearance and much stronger flavor. I usually use plain old unsulphured molasses. Thanks for sharing your recipe. I have been trying to find the perfect soft gingerbread recipe. It’s our family tradition to gather around and decorate gingerbread men. Ill let you know how they turn out. I usually use Grandma’s brand molasses is this ok? That’s the same brand I use! Hi Laura – I just mix powdered sugar with a bit of milk until it is thick but still able to pipe out of the corner of a ziploc bag without running all over the place. Sometimes I add a touch of vanilla, too. Just wanted to say thanks for posting both your gingerbread recipes! My daughter has an egg allergy, so we’re always on the look out for new yummy Christmas treats to make. I’m sure they’ll become family favorites along with your other great recipes that I’ve tried! I absolutely love these cookies. I make them every christmas to put in my gift baskets. They are the perfect gingerbread cookie! You may have ended my search for an egg-less gingerbread cookie recipe. I have fond memories of cooking class in junior high school making an egg-less dough….then taste testing it before baking. I only wish I had made digital copies of all the recipes I got from my teacher Miss Munzer. I am still on the search for the clover rolls recipe. They were so good!! Now have to search for molasses in Japan. We wanted to make these for an evening treat, and I was not about to leave them in the fridge overnight, so I’m glad to know the freezer trick. I wonder if that would work for sugar cookies. ? These are super yummy straight out of the oven and good cold too. 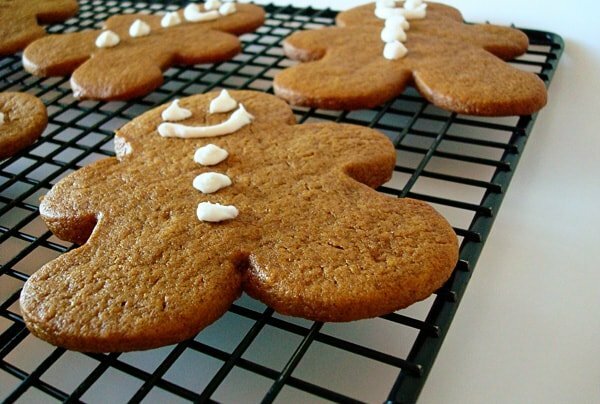 My father-in-law loves gingerbread; I think I might move up to favorite d-i-l status if I make these for Christmas! Made these last night with my granddaughter and daughter. They turned out soo good.. I rolled them out a little thicker and put the dough in the frig overnight rolled out between the parchment paper. LOVE THIS!!! Stacy – I’ve never tried them that way but it’s worth an attempt. I don’t know how they’ll spread/flatten as they bake so I’d start with smaller-sized dough balls. My family loves the hard crispy Peparkakor gingerbread men, I love a chewy cookie but don’t want to go the effort of making another cutout, could you just roll this dough into balls, maybe then in some sugar and bake? Would they turn out the same? Best eaten within one week – are you kidding me? These will certainly disappear the minutes they hit the serving plate! Can’t wait to make them…. These cookies are fabulous!! I’m not a gingerbread fan…NORMALLY….but these, well, I ate three before they were even decorated!! My 11 yr old is decorating them as I write this…and I’m enjoying a cup of hot tea, eating ANOTHER cookie, and relaxing!! Thanks Mel!!! I made a big batch of this dough a few days ago and froze it in the rolled out sheets like you suggested and then covered the whole tray in seran wrap so it would stay fresh through the week. Worked like a charm. The cookies were baked today and they are OH SO TASTY! I’d definitely err on the thicker side when rolling out the dough to make it easier to cut and transfer to the tray. I also would only bake mine for about 7 minutes. And yes, I’m making gingerbread men cookies in September… they are for my kids Candy Land birthday party this coming weekend and of course, we had to have gingerbread men to decorate! 🙂 Thanks for another great go-to recipe! Okay, so I made these and they were a hit! Wowzers, they blew my socks off. I love that they were so soft and not too spicy. Best recipe for gingerbread ever!!!! Thanks! Andrea – high praise! I’m so glad you loved these! I’ve made the dough and am going to bake these with my girlfriends tomorrow morning! Yay for Christmas and yay for delicious gingerbread men recipes posted by Melanie! Merry Christmas!! Sara – I love this idea of sandwiching the cookies together! Thanks for letting me know that you liked this recipe. Ruby – oat flour? Wonderful idea. Thank you for letting me know you liked these! Just an FYI, I used gluten free oat flour for the all purpose and it worked very very well. No gums or other weird ingredients. No one could tell they were gluten free. I did weigh my flour and use potato starch for rolling. Great recipe for those gluten free! That’s awesome! Thanks for the update! I made these and substituted 1/4 cup flour for oat flour and they turned out soooo chewey. Thanks for the recipe! Karin – I’m so glad these cookies were a hit. Thank you so much for letting me know! I’m glad they turned out perfectly. Just wanted to let you know that I tried these and they were delicious. I am never happy with how my cookies turn out-it’s very sad. These were easy to work with and turn out perfect. I think I’m going to try making these later, mine came out hard and crunchy. I like chewy cookies better so I can’t wait to give these a try. Definitely coming back to look at more cookie recipes later. Email from my Aunt Marilyn:…..loved the ginger bread cookies! of course I had to make them in the last 30 minutes I had left before I had to be out the door. They were delicious. Kandi V – I’m sorry these didn’t work out for you. If you haven’t thrown away the dough yet, just freeze or refrigerate again. My guess is that the dough wasn’t cold enough to cut the dough. If you refrigerated the dough, try freezing it next time. The dough needs to be quite firm to cut out into shapes. Good luck! I was excited to make these, and my kids were excited to eat them. So imagine my dissappointment when I pulled them out of the fridge and they were too soft to be cut! They fell apart as I slid my spatula underneath to lift them! We are bummed! Any ides on what happened? Thanks! Don’t you just love gingerbread cutouts. I think of all the Christmas cookies, this is one that defines the season. They are adorable! Leslie, you are correct, there are no eggs. Pat – haha, very funny! Jenni and Christian – these cookies are definitely too soft for gingerbread houses. If you want a fantastic recipe for gingerbread houses (or sleds like we make in our house), email me at mykitchencafe at gmail dot com and I’ll send you my tried-and-true recipe. This looks delicious. I have discovered the joys of ginger in cookies and cakes. I am so excited! I lost my old recipe that I loved and have been sad that other recipes were not so great. Am I reading it right that there are no eggs? 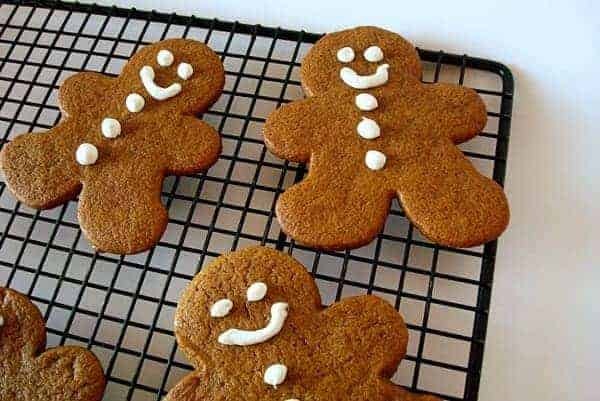 I want to make gender-neutral gingerpeople cookies for the local ACLU holiday party. These will be great! I don’t suppose you have a recipe for feminist frosting? would these be good in shapes to make gingerbread houses too.. or are they too soft for that? Wow–I needed this recipe!! The gingerbread I have tried in the past has been dissapointing! Fun–I love your sugar rush! Merry Christmas Mel! I had this bookmarked in my cookbook at home for when my nephew comes over to make gingerbread men. Looks delicious! Oh Sugar Rush! Bring it on, baby! These Sound wonderful. I’m with you on the hard crunchy cookies, not for me. I’m taking dinner to a friend tonight, this just might be the treat! I love gingerbread men and decorating them. Mine always turn out too hard. I’ll have to try these! They look sooo good! These sound divine! I have all the ingredients…sounds like a good afternoon kid activity! Mmm, gingerbread cookies are one of my favorite Christmas cookies because that’s the only time I make them! These will be perfect for my kids to decorate and take to their friends. I was going to have them take sugar cookies, but these are much more fun. I agree, a soft and chewy gingerbread cookie is the only way to go. I can’t wait for the next eleven recipes. -Liz K.
I also really enjoy soft cookies, so I´m sure this recipe would be perfect. Unfortunately, I can´t head straight to my pantry to bake these up, as I do not have molasses around (yet! ), but this recipe is going directly to my files. Thanks for sharing.